Today we went on an outing to the beautiful little town of Elburg. A truly picturesque town with traditional dutch sailing boats in it’s harbor. Your photos are beautiful. Enjoy your vacation. 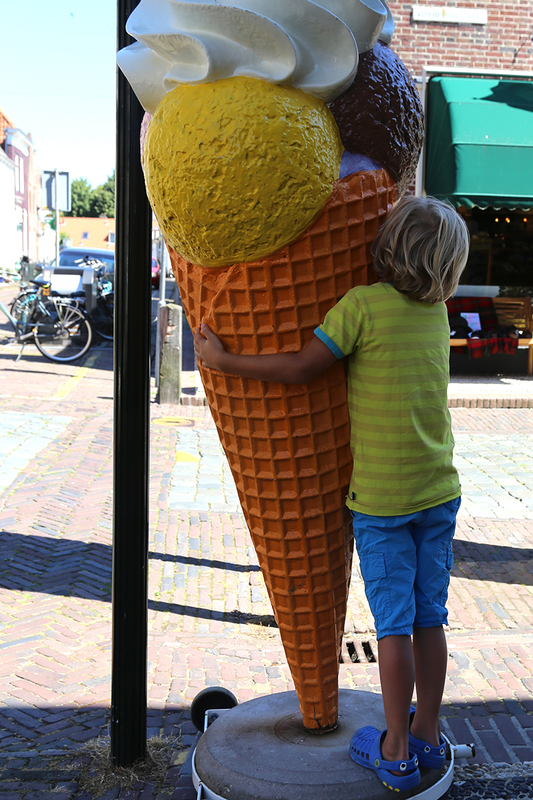 Love the monster ice cream … ! Thanks for taking us along on your vacation, and the visit to this lovely port! I have just returned from Holland were I was visiting my friend near Eindhoven. On Tuesday 12 July we took the train to Zwolle – not far from were you are. I love going to Holland. Elbourg, what a beautiful place to visit, you have managed captured the essence of it beautifully though a lense. Thankyou. It has given me lots of inspiration for my garden with the metal bath tub filled with billowing plants. It looks well worth a visit and looks like you all deserved the ice cream!